Spin Masters specializes in fun and entertaining performances. We specialize in modern photo booths – if you’re looking a the “traditional” box-enclosure photo booth thats not our style. But if you’re wanting something a little more modern and a lot more fun, then that’s us! When you see what we offer, we think you will agree it is one of the best photo booths available in both the St. Louis area and Central Illinois – at any price. Our photo booth service costs less than most area photo booth rental companies! Whether your event is upscale or on a budget, SpinMasters PhotoBooth is your photo booth connection. 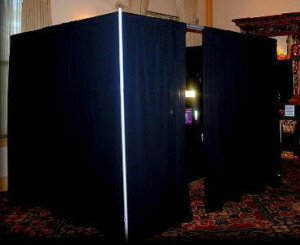 Photobooth rentals are easy to book with us and we can handle your event wherever it is held. We offer package deals that include a DJ, up-lighting, or both! Our photo booths accommodate 1-12 of your guests. Our photo booths are also wheelchair accessible to make sure no guest gets left behind. Spin Masters can handle your wedding, corporate event, reunion or party of any kind. Our booths are assembled on-site and can be configured for your needs. Let us show why Spin Masters provides the best and most affordable photo booth the St. Louis area has to offer! Guests can choose between Black & White or Color Prints. Photos are printed off on two 2″ by 6″ strips. One for the guests and one for the host. Props (boas, hats, masks, etc.) are included at no extra charge. A professional attendant to make sure everything is running smoothly. USB flash drive with all the photos taken from the event. A memory book (additional charge applies) a book containing all of the pictures from your photo booth rental. Guests can write a personal message next to their photos. All photos taken at the event will be posted on an online password-protected photo gallery for your guests to view. The guests will be given a link to the website and the password to view the pictures. All of our photo booth pictures are posted at Spin Masters Photo Booth Gallery.